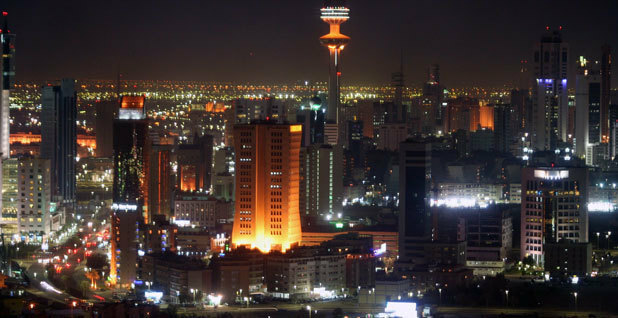 Kuwait City at night. It uses plenty of energy but has yet to submit a plan to reduce resulting emissions. Photo courtesy of Flickr. BONN, Germany -- Kuwait, Malaysia and the United Arab Emirates are preparing to submit their climate change targets to the United Nations, negotiators from those countries told ClimateWire. They are among 41 nations that, for various reasons, have not offered plans for curbing greenhouse gas emissions as part of a new global agreement set for Paris in December. Atif Al Harbi, who leads Kuwait's delegation to the U.N. climate negotiations, said his country did not recognize an Oct. 1 submission deadline that, while informal, over 150 other countries adhered to. He noted that the precise language diplomats created two years ago merely "invites" countries to put forward their plans "well in advance" of the Paris conference. "They didn't say a date certain to submit," Al Harbi said, adding he is "sticking to the wording" of U.N. texts. Nevertheless, he said of Kuwait's target, "We are in the process to submit it." Malaysian negotiator Gurdial Singh Nijar said his country's plan is "on the way" and "almost submitted." A representative from the UAE said its target is "in its final approval stage." The great majority of countries have submitted "intended nationally determined contributions," or INDCs, include the United States, Europe, China and India, as well a number of small and impoverished developing countries. In all, their plans cover 87 percent of global emissions. Observers say some absent countries like Fiji or Syria may lack the capacity or government stability to put together a plan. But major oil producers and their allies -- which also include Saudi Arabia, Sudan, Qatar, Iran and Angola -- have been holdouts for more strategic reasons. "They aren't yet fully on board," said Wael Hmaidan, who leads Climate Action Network International and has worked closely on climate policies in Arab Gulf countries. Nations in the region have all prepared their INDCs, he said, they just haven't pulled the trigger on submitting. "They're trying to make a decision if they embrace a transformation or not. They understand the world is changing. They feel the pressure that they need to change as well. The final thing is that they need to embrace the change," he said. Countries had called for INDCs to be sent in by Oct. 1 so the United Nations could conduct a review of how far they collectively get toward keeping global temperatures at safe levels. That report will be unveiled at the end of the month. Scientists, though, have already concluded the current plans won't keep temperatures from rising above the 2-degrees-Celsius threshold. That will still hold true even if all of the 41 outstanding INDCs roll in, said Bill Hare, founder of Climate Analytics. "It's not fundamentally important. It won't change the adequacy of the whole amount," he said. But Hare and others argued that having as many countries as possible -- especially from among major oil producers -- is politically and symbolically important. "We need to have global participation," said Alden Meyer, director of strategy and policy for the Union of Concerned Scientists. "To have a number of countries sitting on the sidelines, particularly major Gulf countries ... I think it's a problem that some of the largest per-capita emitters, some of the wealthiest countries, have yet to put their targets on the table," he said. Negotiators said there has been some talk of only allowing countries that submit INDCs to become a party to a deal in Paris or of requiring an INDC before a country could access money from the Green Climate Fund. Such a restriction would not apply to least developed nations. Still, several sources said, those discussions have not gone far. It may also be moot because widespread pressure has helped prod some recalcitrant countries to move. Still, what those missing INDCs from Gulf nations will look like is also a key concern. Al Harbi said Kuwait will not have a quantitative emissions target and as a developing country should not be expected to. Instead Kuwait will detail projects it is launching "that have co-benefits" of curbing emissions and helping to diversify the economy. Under the current rules of the U.N. climate regime, a handful of fully industrialized countries are expected to bear the largest weight of cutting emissions and helping developing countries. Al Harbi said developed countries have not yet done enough. "Show us some leadership and we will follow," he said. "They are playing games with numbers." He also pushed back on the widespread perception that the major oil producers have been obstructing climate negotiations. Kuwait, Al Harbi argued, is being hit from both sides. Its economy will suffer if countries truly make good on pledges to decarbonize, and the country also is vulnerable to desertification, rising sea levels and other consequences of climate change. "We care about the climate change. Why do people think we are against it?" he asked. "By the way, for your information we are doing so many things that are nice for the environment, but we don't make a big deal about it like you do in America." Malaysia's Nijar also noted that his country's pledge will be dependent upon "the means of support and enablement." That is, money. "The more ambitious developed countries are, the more ambitious we can be," he asserted. A spokeswoman for the UAE declined to discuss the specifics of the country's plan but said it will be filed early next week. She said the delay was only due to internal process approval delays. Other countries that have not produced an INDC include Brunei, Egypt, Iraq, Libya, Nicaragua, Nigeria, Pakistan and Venezuela. Hmaidan noted that when Qatar hosted U.N. climate talks in 2012, it along with Saudi Arabia, UAE and Bahrain made a major announcement that they would develop climate pledges. So far, none has materialized. "This is the their last chance," he said.